UNAFEI, the Japan Criminal Policy Society Foundation and the Asia Crime Prevention Foundation collectively hosted annual public lectures on criminal justice policy. On 26 January 2018, Visiting Experts from the U.S.A. and UNODC delivered lectures on Culture of Lawfulness and Education for Justice at the Conference Hall of the Ministry of Justice to an audience of about 150 people, including personnel from government offices such as the Ministry of Justice and Public Prosecutors Offices, universities, NGOs, etc. and 28 participants of UNAFEI’s 168th International Senior Seminar. The lectures concluded with great success. (1) Dr. Roy Godson, Emeritus Professor, Georgetown University, U.S.A.
" Revitalizing Urban Civic Culture on the Culture of Lawfulness (COL) "
" Enhancing the Rule of Law in the Field of Crime Prevention and Criminal Justice: Policies and Practices based on the UN Conventions and Standards and Norms "
Professor Emeritus of Georgetown University, Dr. Roy Godson delivered his lecture titled “Revitalizing Urban Civic Culture” on the Culture of Lawfulness (COL). 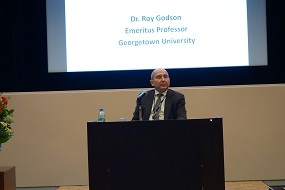 In his lecture, he introduced his experience of disseminating the idea of COL in several countries and the important roles of law enforcement officials, public sector employees, citizens, the private sector, schools, mass media and centres of moral authority in the community to establish fair and safe societies which respect the rule of law. UNODC officer, Ms. Lulua Asaad addressed the roles of the United Nations Crime Congress and the Commission on Crime Prevention and Criminal Justice, and introduced the Education for Justice (E4J) initiative which being promoted by the United Nations Office on Drugs and Crime. Her lecture was titled “Enhancing the Rule of Law in the Field of Crime Prevention and Criminal Justice: Policies and Practices based on the UN Conventions and Standards and Norms”. 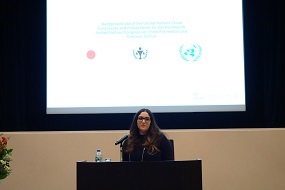 In her lecture, she explained that the UNODC’s efforts to combat crime and the E4J initiative are closely related to Goal 16 of the 2030 Agenda for Sustainable Development, which was adopted by the UN General Assembly.